Being true to my 2019 goals, this is the first end of month recap for the year. This month's recap will not only track my fabric in & out progress, garments sewn, where I'm going with my sewing next month, but also a discussion of some of the issues going on in the sewing community. My sewing mojo did go missing during my Christmas holiday break which also encompassed the beginning of this month. When it came roaring back, I did get quite a bit accomplished but that's mostly due to a three-day holiday weekend. ...and I cut out two more versions of the Dover Jacket, one version of my TNT shirt pattern with a tie top and a Simplicity 8265 vest. I'm working on these pieces over the next couple of weeks. Of course they will make an appearance on the blog during the month of February. I'm adding some more details to my fabric in and out totals this year. This is so I can assess how much of my fabric collection I'm actually using. Last year I noticed, I tended to sew the new fabric - rarely venturing onto the walls. I know some of this was due to the fact that there's so much fabric and I have to move things around to get to the walls. I've changed some of that so the walls are more accessible. Also, I'm making a greater effort to open the curtains on the walls more often. One other note before I launch into in and out totals. This year I have a niece and grandson graduating from high school, so a good part of my sewing (especially this spring) will be about garments for those events. Some fabric purchases this month were made because the special event fabrics were inexpensive and I need a lot of yardage for myself and the granddaughters. My last 17 yards from Fabric Mart fits into this category. These are purchases from EOS, Fabric Mart, Hobby Lobby & Workroom Social. This is high for the month of January. I'm usually much better at NOT purchasing fabric in January - so I will need to watch these numbers going forward. This equals six finished garments (2 of which have yet to be blogged) and four garments cut out and waiting to be sewn. Of the yardage out this month, 1 garment is from deep stash, 5 garments are from the collection (2-5 yards old), 3 garments are from brand new fabric (less than 6 months old), and the final garment is from scrap fabric that was previously used in another piece. While both these totals are high, I've already put more into the collection than taken out - 11 yards more to be exact. I will need to work on this in the coming months! I touched on this in my post "Why Support a Pattern Designer Who Doesn't Support You?" which was based upon the conversation about indie designers including larger sizes in their patterns. Since those conversations started, there's been a lot of movement by indie designers to be more size inclusive. Follow the discussion on The Curvy Sewing Collective and several of the bloggers mentioned in that post. From those conversations some new hashtags evolved to follow on Instagram: #sewmysize #normalizeyoursize #sewinclusive and quite a few of my fellow sewists posted their measurements to IG. We did it to show that we're all normal sized human beings and that our measurements are just tools to get a great fit in our garments. There was some conversation about taking your measurements standing vs. seated. I noted the measurements listed on my photo are my seated measurements. I lose 1-2" in my abdomen and hips when I stand up. Oh and its important to note that I've gained back 25 of the 35 pounds I lost 4 years ago. I will also admit that in the summer under my dresses and skirts I wear thigh length spanx. Some for tummy control but most for the suppression of my thighs and to cover them so they don't rub together when I walk. Several of my jeans have tummy support/control and I also wear spanx leggings at times. Finally, if you're a plus size sewist looking to support other indie pattern makers who design for your size, Megan has listed them all in this blog post. I encourage you to buy from them...I know I will! Lastly another sewing great has passed away. Cynthia Guffey died last week of throat cancer. I wrote a blog post on the effect she had on my sewing back in 2006. She has continued to influence it to this day. For her admonishment to slow down and enjoy the process, to how I measure my body, even to the amount of piping I use and how I apply it. I took every class she had at sewing expos back when I went as often as I could. She, like Nancy Zieman, greatly influenced the sewist I am today. She will be missed. May she rest in peace! Wow! That was a lot happening in January! I love your goals and I love the tunics. You inspired me to buy the pattern. We're still in the height of summer but I know that the pattern will be used a great deal. I never thought of taking measurements sitting down, it makes so much sense and explains why some pieces are so uncomfortable. As always your blog is so inspiring, I just love reading your posts. This is just a great blog post. I love that you have sewing goals and that you're writing to hold yourself accountable. Well done. I know what you mean about ignoring fabric that's hard to access. With scattered storage areas (drawers in various dressers, some in closets, etc) I had the same problem. I recently made a form, basically a 6x2 table in Word that I printed out, with areas in each cell to record fabric description, sku#, supplier, content, stretch%, care, fabric weight, width and yardage. I then staple a small 1"x 2" sample of the fabric to its cell. I put the pages in a notebook, and can easily flip through to see what I have. As a fabric is used, I record the pattern and make an "X" through the entry so I know it's no longer in stash. If there's a sizeable remnant, I update the yardage. With a large stash, you probably wouldn't want to record everything, but just having those samples available to flip through might be helpful. Oh, that's so sad about Cynthia. I took a class with her a couple of years ago at a sewing expo. She was so smart and funny and snarky. I loved her (and her patterns). Tracy - right! She was an amazing sewist and I will miss her! I really enjoy your new classification system - I'm going to adopt something similar! My stash is smaller (well, my fabric stash - I'm not talking about the yarn la la la) but I love to keep it all in a spreadsheet and refine. I am waiting for my husband to find my kid's art supplies in the basement (will the unpacking never end?) so I can work on my croquis from My Body Model. I've not really been able to get into this before - I'm not much of a draw-er - but I need to find ways to be creative that are VERY quiet and calm. Let's see if this fits the bill. Really enjoyed your recap Carolyn, and I know it is work and so hope you get lots out of it too! I never thought of stash in three time layers before - that is a very useful perspective I am going to adopt. Great Round Up. I agree ... so much happening in January. I just got back from a 5-day trip away for family stuff. I'm still exhausted. LOL! But I'm also hoping to spend time sewing and relaxing this weekend! I NEED you to sew and relax! Aww, so sorry to hear about Cynthia. Lots of yardage out this month! And it sounds like quite a bit of the fabric in will be sewn soon. Can you recommend your preferred thigh length spanx. I really need one, but do not know which brand.what size etc. You make so many new outfits for yourself! I'm curious about what happens to them all. Do you keep them? Give them away? What's your criteria for giving or keeping? Pattyskypants - I had NO casual clothing when I started this job. So it was starting from scratch to make things. Some things got worn alot and wore out. Some things I realized really weren't me, so they will be donated. Planning on doing a big cleaning out come spring and keep only the things I love. Very nice round up! I didn't even know that Cynthia Guffey died. I had the pleasure of taking one of her classes at an Expo a few years ago, and she was amazingly knowledgeable. Cutting out projects is my least favorite part of sewing. I've been more productive and enjoy sewing more since I started cutting out multiple projects. I'm working on sewing from the stash more because I have run out of room. It is working because I used stash fabric for every garment that I worked on this month. It is cool to use a fabric that has been sitting on the shelf for awhile. I'm a lousy record keeper so I'll use either "new" or "stash" to track fabric. I don't have any demands on my time this weekend. I plan to finally tackle the top of the shelving unit which is piled high with fabric. I have avoided dealing with it so I'm not sure what is up there under the mound of fabric. I need to plan and cut out the next set of projects. I was so sad to hear that Cynthia passed. I bought a few of her patterns and always took her classes at Expo (puyallup, WA). She was a hoot. 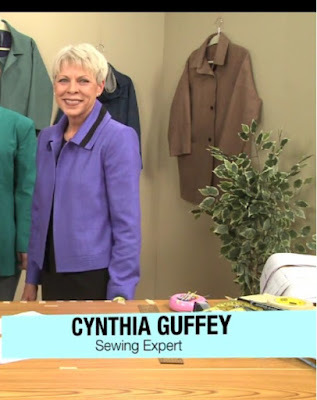 Some lady asked how to do whatever it was Cynthia was talking about on a serger. Hooo boy! Cynthia certainly had opinions. And women's pockets are for show, not your hands! She will be missed. I bought my first pair of spanx recently when I decided my knit dresses could be a bit smoother. Ah the joys of our bodies changing. I noticed on your Instagram post you said you were 60. I don't recall you having the big birthday?? I'm 60 too (how did that happen?). You did have a productive month and I like how you classified your fabric options. Happy February! Vicki - I don't celebrate my birthday on social media. Sometimes I will share party pics but if it's nothing special...it's kinda another day. Your January is so productive! I love seeing all of your makes together like this. Have you considered taking a picture with your cell phone of each piece as it enters the stash? And on a raining day attacking the stash itself? I do this and keep the photos on my laptop, along with comments as to how much, date, fabric, etc. And then add comments, pattern nos, etc., when (if) used. The file goes to google in the sky and can be accessed from my phone when shopping. A spreadsheet works well for notions, esp. zippers (length, color, type, etc.) and buttons. Photos of the buttons can be added to the spreadsheet as well. Pattern envelopes are scanned and entered into the system as well. Love your site.